from traditional PR and online reputation management to strategic blog direction and writing, to email marketing campaigns and more. Love & Company began with the strategy of regularly adding high quality content to the Pennswood Village website as a key to improving search engine optimization (SEO). We developed blog content and a landing page for Pennswood’s website that covered informational topics- frequently asked questions, resident and staff profiles, community highlights and event features. Once the blog was established with a strong base of topics and posts, we were able to use this content to develop an enewsletter. After designing a visually attractive template, current leads in REPS were offered the opportunity to subscribe to the enewsletter. Those who opted to receive the enewsletter became our subscriber list. In addition, readers of Pennswood’s blog and Facebook page are offered the opportunity to subscribe to the enewsletter. We also strategically repurposed content from blogs, website landing pages and upcoming events into enewsletters to cost effectively redirect subscribers back to the Pennswood website, and encourage regular engagement. From the beginning, open rates and click rates proved that the enewsletters were a big hit with Pennswood Village’s prospective residents. While industry benchmarks are a 20% open rate and 3% to 5% click rate, Pennswood’s enewsletters regularly boasted open rates higher than 80%, and click rates north of 15%. At the time of this case study, the average open and click rates for Pennswood Village’s enewsletter list are 63.6% and 12.9% respectively. As the enewsletter developed, we began seeing a strong climb in website page views. Pennswood’s blog now has thousands of page views, with more than a dozen individual posts each boasting more than 100 page views. However, the open rates, click rates and page views alone, while important, aren’t able to truly quantify the effect and sales value of a quality digital strategy. To illustrate a more accurate value, we implemented one of our proprietary reporting methods that integrates data pulled from REPS with data from an enewsletter subscriber list. We compared the member rating of each individual user to that user’s REPS status code each month, and tracked which topics that prospect showed interest in most. These data became invaluable to the sales team members, who were able to use this information to their advantage when interacting with prospects, thus improving their closing rates. To accurately analyze the effect of the enewsletters, we created a control group from a list of active leads in Pennswood Village’s database who are not on the enewsletter list. The second group, the comparison group, was made up of only leads who were on the list. We tracked the REPS status codes for each prospect from each month, and tracked each prospect from November 2014 to July 2015. Each status code represents a place in the sales pipeline, describing where a current prospect is in this pipeline. A move closer to move-in- for example, moving from “Cool” to “Warm”- is a positive move. Moving from “Cool” to “Hot” would be two positive moves. A move further from move-in- for example, moving from “Hot” to “Warm”- is a negative move. Moving from “Hot” to “Cool” would be equal to two negative moves. For people receiving the enewsletter there was a 35% increase in positive moves, 27% decrease in negative moves, and a 212% increase in the number of prospects who had a positive move of five or more spaces. Analysis of the full lists of prospective residents (including those who showed no movement), the average moves in the sales pipeline per person revealed a 140% increase for prospects who received the enewsletter, when compared to the control group that did not receive the enewsletter. Is your digital strategy helping you decrease the time to move in? Are the social media topics you’re covering effectively helping you to increase your closure rate? Do you know the effectiveness of your digital marketing efforts? Love & Company successfully manages the strategy and implementation of engaging, effective digital communication with prospective residents, providing a valuable asset to your sales team. A comprehensive enewsletter strategy proved valuable for Pennswood Village. Prospects who received the enewsletter saw 140% increase in average moves up the sales pipeline over a control group. 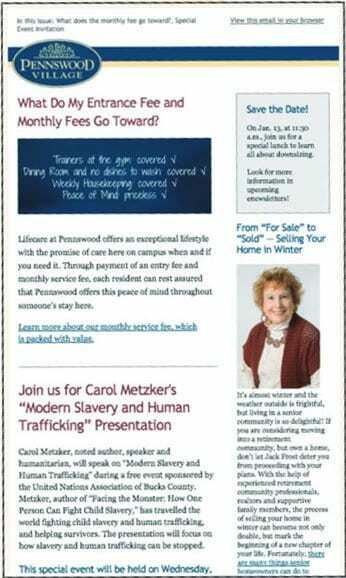 An example of one of Pennswood Village's enewsletters, highlighting popular blog posts.